Be among the first to tour these inspired two-story floor plans! 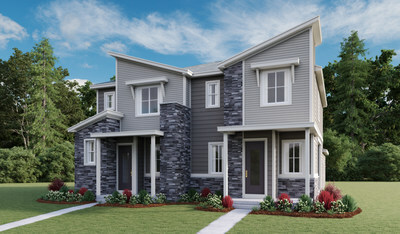 AURORA, Colo., April 2, 2019 /PRNewswire/ -- Richmond American Homes of Colorado, Inc., a subsidiary of M.D.C. Holdings, Inc. (NYSE: MDC), is pleased to debut its brand-new Urban Collection™ at Cross Creek in Aurora. The notable new neighborhood is the first in the state to model the highly anticipated paired home series. Prospective homebuyers and area agents are invited to attend a Grand Opening celebration on Saturday, April 6, from 11 a.m. to 2 p.m. Guests will enjoy a complimentary food truck lunch, exciting giveaways and tours of the Boston and Chicago model homes, which offer two and three bedrooms, respectively. 2 to 3 bedrooms, approx. 1,260 to 1,470 sq. ft. Ask a sales associate about special offers at this exciting community. Urban Collection at Cross Creek is located at 23504 E. 5th Place in Aurora. Call 303.575.4094 or visit RichmondAmerican.com for more information.